Hellblade’s binaural 3D sound design aims to mimic the sensation of someone suffering psychosis: ghostly whispers, guttural screams, pitchy wails, and demonic growls feel like they originate from within your skull. The voices simultaneously encourage, mock, and chastise, all of them speaking over each other, interrupting and contradicting, causing you to doubt yourself. 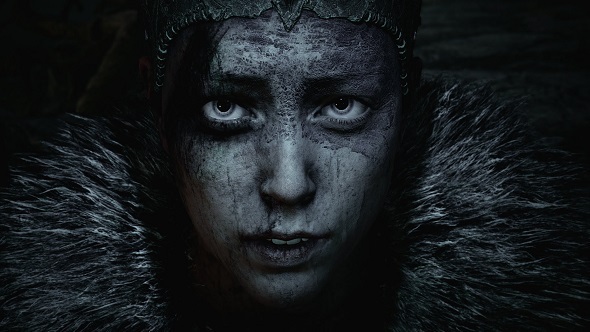 Having been fed Norse tales through her childhood – like Ragnarok, an apocalypse where even the gods expire – our hero Senua struggles with mental illness while attempting to parse reality from legend. We tested how many deaths it would take to wipe our save game. Senua sees faces in rocks and trees and notices symbols in shafts of light, all while that confusing chorus rattles in her mind. For the residents of her village, this isn’t a mental illness – it’s a curse. 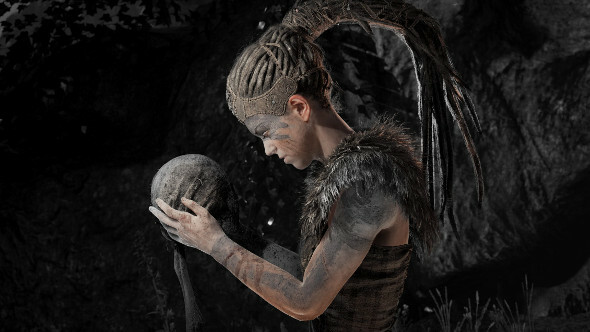 The game employs these audio tricks along with visual distortions and hallucinations, all backed up by the excellent mocap and voice acting of Melina Juergens, so you experience what Senua does. When you’re in control, you’re either exploring the game’s wonderfully-realised environments, solving puzzles – mostly by matching symbols with natural shapes – or fighting. The combat system in Hellblade is the simplest developers Ninja Theory have ever created, governed by blocks, parries, dodges, light attacks, heavy attacks, and guard breaks. 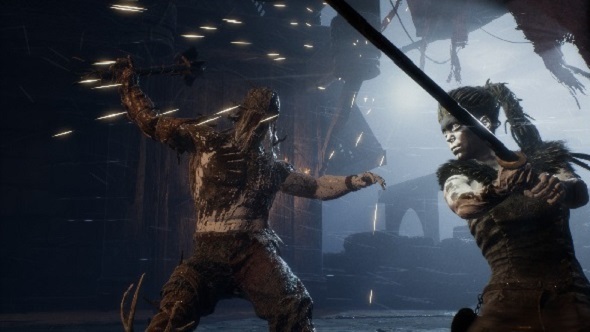 Attacking straight after a dodge allows you to close the distance between you and your opponent with a second strike, repositioning Senua for her next volley in the process. Meanwhile, a special meter fills up during combat and allows you to briefly slow enemy movement to a crawl. Despite this simplicity, each fight – at least for the first two thirds of the game – feels meaningful. 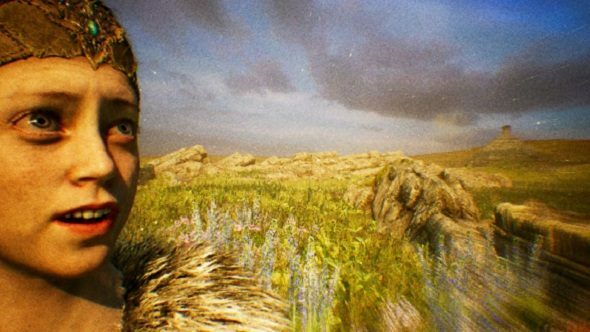 Ninja Theory are certainly brave for tackling mental health in a game built around sword combat, but that’s not the only plucky development decision the UK-based studio greenlit: Hellblade has the threat of permadeath. Yep, you heard right: this is an eight hour, plodding adventure game which threatens to send you back to the start, your progress erased, if you keep failing. How close you are to that happening is represented by an oily corruption that snakes up Senua’s right arm. Each time you’re killed, this manifestation of her ‘curse’ spreads. Should the inky tendrils of her perceived affliction reach her head – the seat of the soul – you’re told Senua will give in to her anguish. It plants the seed early on – after your first, unavoidable death – with the only fourth-wall breaking tutorial message in the game: if you die too often, your save will be erased. The awareness of your apparent mortality completely changes the stakes – you, like Senua, are afraid – though it’s a double-edged sword. On the one hand, every fight feels desperate – the fear of failure hangs over every encounter. Even in sections where the environment is the danger, you feel the panic as rooms fill with smoke and fire as you stumble to the exit. As Ninja Theory intend, the hallucinations and threats feel like real dangers. It’s a clever conceit, but it makes you feel cheated when you die. You see, the game sometimes breaks its own rules. For example, the first time I died, it’s because I fell from a balancing beam. I’d crossed a few beams up to this point and none of them needed me to actually balance, only to push forward. This specific beam wanted me to keep Senua upright. A mix of both of these appear throughout the game. Another example: Hellblade often uses light to signify where to go, but in one scenario running towards the light means instant death. You’re also taught in your first fight that sometimes you’re meant to fail. This pops up again much later, but every encounter that drags on leaves you wondering if you’re meant to die. In making the game cinematic – with barely any UI and nothing in the way of tutorials – it’s hard to tell if you’re progressing in battle, particularly later on when enemies soak up more damage and keep spawning in as others are dispatched. It’s clearly all intentional on Ninja Theory’s part, though. In embodying Senua, we also feel confused, unsure of what’s real, unaware of which dangers can be fatal. Unfortunately, it only leads to real frustration when you’re killed in a cheap way – and there’s plenty of that later on when you’re up against enemies you can’t fight back against. Hellblade does exactly what Ninja Theory set out to do: tells a story about psychosis in a respectable, engaging way, while taking us outside our comfort zones just like its protagonist. Cinematic games don’t lend themselves well to repeat playthroughs, though, so Hellblade’s threat of permadeath is more a fear of having to plod through scenes you’ve already witnessed. It works in harmony with the story’s themes, but you’re scared of something different to Senua. The entire experience is built with one goal in mind: to put you in Senua’s muddy boots. In that, it’s not always successful, but it’s easy to see what Ninja Theory were going for. It’s a game that will still be whispering in your head long after completion, but it feels like an ordeal that you wouldn’t want to experience again.